Ayala Land Premier, (ALP) recently took to the fairways with its first golf invitational at the Ayala Greenfield Estates in Calamba, Laguna. ALP clients, business partners and media friends chased birdies, pars and agonizing bogeys, and more, on the 18-hole, par-72 course designed by Robert Trent Jones Jr., hemmed in by stunning views of Mt. Makiling and Laguna de Bay. Major sponsors included El Nido Resorts, Lucerne, Focus Global Inc, Smeg, Bang & Olufsen, among others. 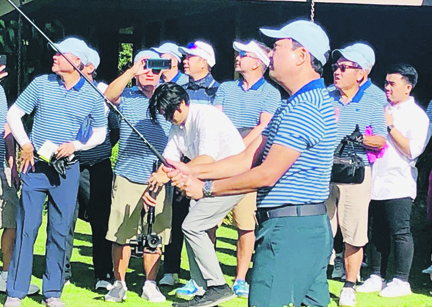 Augusto Bengzon, senior vice president and chief finance officer of Ayala Land Inc. (shown above), and Paolo Viray, head of sales and marketing of ALP, led the ceremonial tee-off.